Super soft makeup brushes, ideal for sensitive skin. Use with any face products including liquids, creams, powders. Design to get in all areas of your face for flawless, HD application. 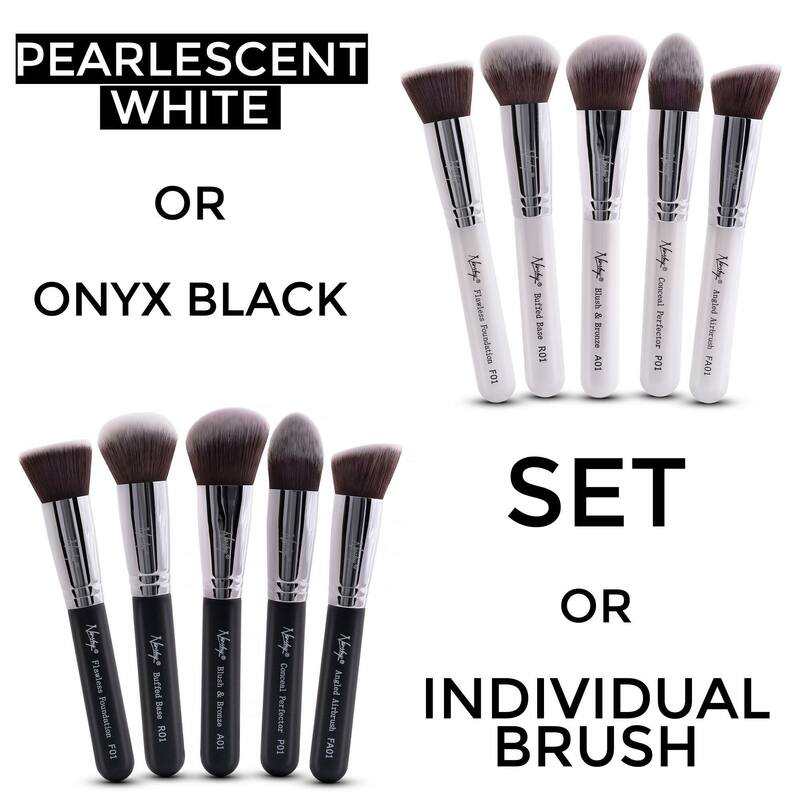 In a short period of time, this face brush set became very popular amongst bloggers, vloggers and MUA’s. Please take a look at the YouTube video above to get an idea. Unique pointed brush with a soft rounded tip can be used in specific targeted areas to apply and blend any concealer, foundation, or tinted moisturiser. The perfect flat shape allows for apply, blend and buff foundation, powder, blush and bronzer. 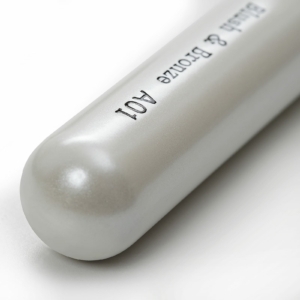 It allows for easy application of cream, liquid or powder formulas. 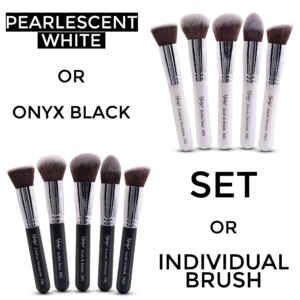 All 5 brushes can be purchased as a set as well as individually. Thanks Lauren, we’re glad you like them. Please stay tuned, our new brush set is on its way. We really hope we can make a brand that is more affordable and widely available in UK and Europe. Brands from across the ocean are great but by the time they arrive here the prices jump over the roof. These brushes look very nice! I love the basic white design. I ordered a set for me and can’t wait to start playing with it. Do you plan in launching an extension to this set? With other face and eye brushes? This would be great! We’re glad you like them. We’re now working on our new complete set. You can check a photo of a sample on our homepage. It’s a gold set including all essential brushes. Soft synthetic bristles, stylish design, handy bag. However if we see that there is a demand for the type of brushes with white handle we’ll definitely extend it. Our brand is about what the customers want and need so we’re always open for suggestions. It would be great if you decide to make the brushes with the white handle. The gold set look very gorgeous and elegant, but in white it would be so classy and would fit the foundation brushes set perfectly. I am already following you on Facebook and looking foward to your future releases. Thank you for your suggestions. We’ll certainly look into extending this range of brushes. Hi Georgia, we’re happy you like it:) Our brushes are currently only available online. Due to a high demand the Flat Top brush has sold out very quickly and we’re working hard to make more available very soon. We’ll keep everyone posted. Thank you for your email, it has been replied to now. Hi, I’ve sent you an e-mail. Can you please look on to that? Hi, I’m an italian make – up blogger. Could I try your brushes?? But I don’t find your e-mail! Hello, I’ve sent you an e-mail. Could you please look on to that? I am an Australian beauty blogger and youtuber. I would love to work with your company, if you are interested. I have sent you an email, and am just posting this to ensure that there have been no problems with the sending of the message. Please contact me back if you are interested. Our PR department will be in touch with you. I’m a regular tester/blogger and poster on several popular makeup communities on Reddit, and I’m very interested in reviewing and testing out some of your products as well as get the word out. :) I’d love to hear back from you, please feel free to send me any contact me and send any questions at the below email. Love these brushes. Perfect size, feel amazing on the skin and give a great finish. The Round and Angled buffer brushes are my favorite. Was very excited to receive these brushes, ordered from beautystore4u and I have never been so dissapointed in a brush before. I thought it was a good price deal and the reviews seemed good. I experienced ALOT of shedding before use, alot of shedding from all my brushes came out so I thought it would be best to use a light application with these. A whole CHUNK of bristles from my flat angel top brush came out of one use, even though I used it lightly. I left this and tried the other brushes, not as much shedding at the other but still left bristle hairs on my face. I have never experienced this with any of my other brushes cheap or expensive. The only positive is that the bristles are soft and that the brushes are cruelty free, ill probably have to buy a new brush set it 2 months since they’ll be no bristles left ! I wish someone had told me but I recommend you to just invest in a good quality brush that will last. No point in constantly buying new ones because the price is decent since it wont last. Wasted money and very upset. We’re very sorry to hear about this issue. It is very unusual to happen. All comments from our customers are positive and we take extra care during quality checks. Please contact your retailer for a replacement. Hi Kat, our products are currently available to purchase from our retailers but we’ll launch an online shop soon.